Product categories of Sand Making Plant, we are specialized manufacturers from China, Sand Making Plant, Sand Production Line suppliers/factory, wholesale high-quality products of Stone Sand Making Plant R & D and manufacturing, we have the perfect after-sales service and technical support. Look forward to your cooperation! The Sand Making Plant includes three stage: coarse crushing, fine crushing and sand making. Every stage has different processing machine. In the coarse crushing, Jaw Crusher is used to crush quartz into small sizes. 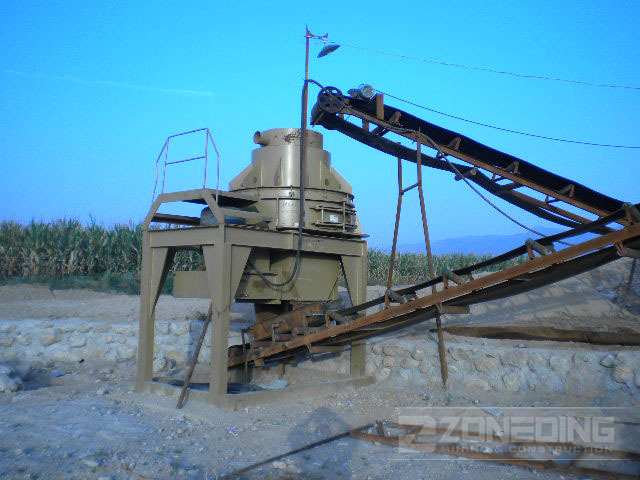 In fine crushing process, Cone Crusher is used as finer crusher for smaller particles. After these two crushing process, small particles enter into the Sand Making Machine to make sand. The amount & model of the machines in the production line can be chose according to the capacity. Application: building materials, highway, railway, water conservancy, concrete mixing station, etc. The production line is designed according to customer's requirement on the output size, types of output and capacity, as well as other factors such as material property, site conditions and purpose. The arrangement of the machines in the production line can work efficiently and act for the maximum effect, which can ensure the efficiency and increase the output in unit time so that to lower the average cost of finished product (per ton). It is much convenient for replacement and maintenance of the machines. Shorten the shutdown time resulted from those maintenance. The optimized production flow can ensure the capacity of the whole production line, the density of piling up and the shape of finished product, to satisfy the various purpose of product.